Live in Poway, CA and searching for a reliable plumber for your all your water heater service need in your area? We can handle your plumbing emergency problem! A leak in a pipe usually means that your fittings and pipes are corroded. We’ll find your broken pipe and/or leak and fix it any time of day or night at a price you can afford. Even a small leak can cost you big time. We’ll fix it at a price you can afford! How often do you read your water meter? Have you noticed a sudden, unexplained increase in your water bill? Is there standing water on your property during dry weather? These could be an indication that you have a broken pipe, either between your house and the meter, or worse, somewhere inside your home. There are many ways that even a small leak can cost you big money. Slow damage to drywall, ceilings, cabinetry and floors can occur. If the leak is in your hot water system, you may also be paying for the energy to heat that wasted water. If you don’t check your water meter regularly, this problem could continue over several months, costing you money and potentially wasting hundreds of gallons of water. If you suspect a leak, you’ll want it handled quickly and professionally. Call All American Plumbing and one of our friendly technicians will diagnose and repair your broken pipes or water leak. All American Plumbing are the experts when it comes to repairing or replacing broken water pipes. Not only does our team at All American Plumbing search and locate your broken pipe, but we also have numerous ways to repair the broken sections. 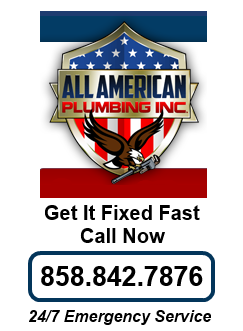 All American Plumbing can repair all broken pipes in any type of material in any location. The specialist team at All American Plumbing are fully equipped to carry out the testing procedures in order to ascertain what pipe is broken and where. This eliminates large amounts of damage being caused in the process of locating and repairing the broken pipes. The team at All American Plumbing also specialize in leak detection. We’re able to carry out testing procedures to pin point the cause and locations of water leaks. This allows us to provide you with a cost effective solution on the necessary repairs with minimal damage or disruption to the dwelling. All American Plumbing can also rectify the leaks from start to finish. From a leaking shower base to a complete bathroom refurbishment. This takes the hassle away from you. Just call All American Plumbing and as we will take care of the rest for you. Call us now … We can handle your plumbing needs! AO Smith Recalls Residential Water HeatersﾠﾠConsumerReports.orgA.O. Smith recalls about 616000 residential gas or propane-fired water heaters. Consumer Reports provides the details. Live in Kearny Mesa, CA and searching for a reliable plumber in your area? Live in San Diego, CA and searching for a reliable emergency plumber in your area? You might have heard about water filtration system for quite some time but, for some reason, you have not implemented it in your home. Here’s your chance to take another look at its benefits and why you should go for water filtration installation, San Diego. Have potable water. Clean and potable water isn’t just good to taste, but it will also help ensure that what you are using on a daily basis is safe – be it for food preparation, bathing, washing, and some other household chores. Helps avoid water-borne illnesses. From diarrhea to skin diseases – these illnesses can be acquired by consuming water that is not potable. To avoid such issues and their complications, a water filtration installation, San Diego is highly recommended. Even if your county’s public water system claims to be delivering potable water, you simply cannot tell how clean it is, unless you know how the process of delivering water into your household is done. On-going support. Another benefit of an installed water filtration system is that you can get an ongoing support from your installer. With that, you can just make a call in case you suspect an issue with your water system – e.g. the effect of change in season to your water system. Your installer will also give you updates whenever there arises an issue regarding your public water system. In fact, some water filtration installer have a 24/7 client support to help customers in addressing issues concerning their water system. Peace of mind. With the benefits mentioned, you can have a peace of mind and confidence knowing that you and your family members are more protected from any threat associated with unclean water. For inquiries on professional water filtration installation, San Diego, contact us at 858-842-7876. Live in San Diego, CA and searching for a bathroom plumbing installation service company? Live in San Diego, CA and searching for a plumbing camera inspections service company? Not all plumbing issues are considered emergency. Some works can wait; some need an immediate action. Some fixes can be DIY-ed; some need the help of a professional. So, the question now is: When can an issue be considered an emergency plumbing, Mira Mesa, CA and therefore requires the help of a professional? The risk of damage to property is high. A plumbing leak that causes water to drip out into the porous area of your property can potentially damage its foundation as it weakens its integrity. Furthermore, damp areas can also harbor molds. As a result, it will require more repair and maintenance and therefore more money to shell out. Remember, these issues can also be a reason for your property to get undervalued. It puts your family at risk. The weakening of the structural foundation of your house can put your family members at risk. It can become accident-prone as some areas become slippery due to leaks. Some parts might collapse and some areas might become unsanitary as they begin to attract pests particularly in the damp areas. There is a potential huge increase in water bill. Remember that a few drops of water can fill a huge container in time. How much more if the leak is huge? It will certainly make a significant increase in your water bill. That just means that you should not take it for granted even if the leak is relatively small. It is so important that you call, right away, a professional that offers an emergency plumbing, Mira Mesa, CA, if you notice a pool of water in your property – even if you do not see the leak. The leak could be from the pipe or water system installed underneath the floor, which can hardly be found by a DIY inspection. However, professional plumbers are usually equipped with water leak detection system, which allows them to spot the issue a lot easier. Looking for a contractor for emergency plumbing, Mira Mesa, CA? Contact All American Plumbing today at (858) 842-7876. Whenever there is a plumbing issue at home, you are likely to ask yourself whether such issue can be fixed all by yourself or it requires the help of an emergency plumber, Rancho Bernardo. That is understandable as you do not want to spend some amount on something that, perhaps, isn’t necessary. The question now becomes: When to call an emergency plumber? The plumbing issue can’t wait. Supposing you see a pool of water on the basement floor but you can’t seem to find the source of the leak. The service of an emergency plumber, Rancho Bernardo, can be a great help to fix the issue; it helps so that wasting of water can stop as soon as possible and avoid your money going down the drain. The leak poses hazard. When a water leak inside your home drips down into your electrical wiring and poses hazard to you and your family, this should be address immediately by calling an emergency plumber, Rancho Bernardo, and have the issue fixed before it gets worse and puts your entire family to hazard of possible electrocution. The leak threatens the structural foundation of your home. When there is a huge burst of water pipe, you are not only losing some money down the drain, but such issue can also put your family in danger – from possible collapse of any part of wall of your home due to the weakening of its structural foundation brought about by water penetration or absorption. Resale value of your property can be compromised. When you plan to put your property up for sale in the near future, all the more make an effort to address plumbing issues as soon as possible. Take note also that a weakened structural foundation can potentially diminish the resale value of your home. Thus, it makes sense to call an emergency plumber right away if you cannot handle the problem on your own. For plumbing emergency service, don’t hesitate to call an expert in Rancho Bernardo. Contact us here at All American Plumbing at (858) 842-7876. Live in Mira Mesa, CA and searching for a plumbing service company? How to check for hidden leaks in your plumbing. Live in Rancho Santa Fe, CA and searching for a plumbing service company? For more check out our website below.